Agroforestry is a form of multiple cropping in which annual herbaceous crops are grown interspersed with perennial trees or shrubs. The deeper-rooted trees can often exploit water and nutrients otherwise unavailable to the crops. The trees may also provide shade and mulch, creating a microenvironment, whilst the ground cover of crops reduces weeds and prevents erosion. One main advantage of agroforestry is that it provides vegetative material that can be used as mulch, and protect the soil from erosion, desiccation and heat. Agroforestry – land with greater than 10% tree cover – makes up 43% of more than 1 billion hectares of global agricultural land, 190 million of which are located in sub-Saharan Africa. Agroforestry systems can be classified in a variety of ways, most commonly by their structural characteristics, such as for the types of trees that are grown or the crops and animals with which they are integrated. Some of the most commonly used practices included alley cropping, forest farming, erecting buffer strips, windbreaks or shelterbelts. The type of agroforestry system used and trees grown depends on factors such as the location, soil type and crops native to the region. If an agroforestry system is to be successful, the tree species must be chosen carefully, depending on both environmental and social suitability factors. The integration of trees on farms can result in impressive benefits for yields, resource use and conservation, bringing both environmental and economic benefits. 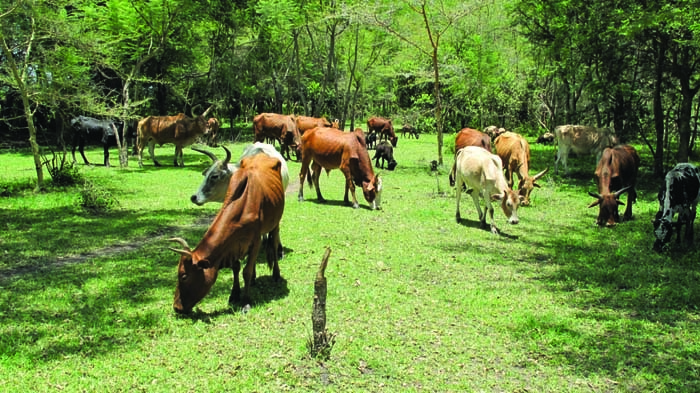 Agroforestry systems can improve farm profitability by increasing productivity (when the tree and crop or animal combination is greater than a single component alone); increasing the productivity of crops and livestock by providing shelter and nutrients; and increasing the financial diversity of the farm and its ability to withstand and adapt to new conditions. Trees themselves can also be a long-term investment. Agroforestry also helps to conserve and protect natural capital by limiting soil erosion and creating wildlife habitat. Care must be taken, however, to ensure that the trees do not overpower the crops leading to crop damage or stunted growth that results in economic losses. The presence of trees and shrubs can aid crops in making better use of soil nutrients and light or provide new sources of nutrients as the tree roots reach deeper into the soil horizon. Nutrients absorbed by the tree are returned to the soil in leaf litter, resulting in better production in comparison to a single crop. Where trees are leguminous, soil fertility and crop yields improve due to additional nitrogen made available. Beyond the soil, trees can have multiple benefits that provide a better growing environment for crops and animals, allowing them to become more productive. Shrubs and trees can act as wind barriers protecting crops and livestock from weather extremes, harsh climatic conditions, and soil and water erosion. Trees can also function as “bio-filters” of dust, noise and odours, as well as provide a food source and shelter for livestock. Agroforestry systems can also be managed to provide vegetative material that can be used as mulch, protecting the soil from erosion, desiccation and heat. Trees planted in a field can lower yields of food crops by reducing the amount of space available to grow crops. However, if both crop and tree products are taken into account, a higher total yield from unit of land will be achieved than in a monoculture. Agroforestry also carries the risk of introducing new species such as eucalypts that in certain circumstances may harm the growth, survival and reproduction of crop species. According to the Intergovernmental Panel on Climate Change (IPCC), most of agriculture’s potential to mitigate climate change lies in improving the soils’ ability to sequester and store carbon. Trees are well known for their ability to sequester carbon from the atmosphere. In Africa, although measures of carbon stocks and carbon sequestration vary widely across the continent, agroforestry systems have been found to be the third largest carbon sink after primary forests and long term fallows. Agroforestry systems in general have 3-4 times more biomass than traditional treeless cropping systems. Whilst field measurements to validate agroforestry’s potential in mitigating climate change are limited, agroforestry systems can sequester more carbon both above- and below-ground than treeless systems as well as to store more stable carbon in the soil. Agroforestry systems can also play a part in reducing pressure on natural forests for products such as timber and fuelwood and offer sustainable energy options. In sub-Saharan Africa, 15% of farms have tree cover of at least 30%. Across the whole continent, approximately 1.55 billion hectares are suitable for some type of agroforestry. This indicates that there is significant potential in Africa for sequestering carbon whilst maintaining, or even boosting, production on farms. Despite impressive results achieved at experiment stations and demonstration farms, adoption of agroforestry as a type of multiple cropping has been poor. This is partly because it has been developed as a package, whereas farmers tend to be more willing to adopt various components, gradually modifying their farms. More labour and time is required for agroforestry than for conventional agriculture, as trees need to be watered regularly and require more care when young. However, row planting trees allows weeding for trees and crops to take place at the same time, reducing the amount of labour. Zomer, RJ, Trabucco, A, Coe, R, Place, F, van Noordwijk, M & Xu, J 2014, Trees on farms: an update and reanalysis of agroforestry’s global extent and socio-ecological characteristics. Working Paper 179, World Agroforestry Centre, Bogor. Briggs, S 2012, Agroforestry: a new approach to increasing farm production, A Nuffield Farming Scholarships Trust report sponsored by the NFU Mutual Charitable Trust. Available from: <http://www.nuffieldinternational.org/rep_pdf/1341272658Stephen-Briggs-2011-report.pdf> [25 June 2015]. Schwab, N, Schickhoff, U, Fischer, E 2015, ‘Transition to agroforestry significantly improves soil quality: A case study in the central mid-hills of Nepal’ Agriculture, Ecosystems & Environment, vol. 205, pp. 57-69. Bamulabire, N 2011, ‘Agroforestry practices in Uganda’ Trees and Farming, vol. 62, pp. 20-22. Smith, P & Bustamante, M 2014, ‘Agriculture, Forestry and Other Land Use (AFOLU)’ in: Climate Change 2014: Mitigation of Climate Change. Contribution of Working Group III to the Fifth Assessment Report of the Intergovernmental Panel on Climate Change, eds OR Edenhofer, R Pichs-Madruga, Y Sokona, E Farahani, S Kadner, K Seyboth, A Adler, I Baum, S Brunner, P Eickemeier, B Kriemann, J Savolainen, S Schlömer, C von Stechow, T Zwickel & JC Minx. Cambridge University Press, Cambridge and New York. Oke, DO & Odebiyi, KA 2007, ‘Traditional cocoa-based agroforestry and forest species conservation in Ondo State, Nigeria’ Agriculture, Ecosystems & Environment, vol. 122, no.3, pp. 305–311. Takimoto, A 2007 Carbon sequestration potential of agroforestry systems in the West African Sahel: an assessment of biological and socioeconomic feasibility, Ph.D thesis, University of Florida. Mbow, C, Smith, P, Skole, D, Duguma, L, Bustamante, M 2014, ‘Achieving mitigation and adaptation to climate change through sustainable agroforestry practices in Africa’ Current Opinion in Environmental Sustainability, vol. 6, pp. 8-14. Unruh, JD, Houghton, RA, & Lefebvre, PA 1993, ‘Carbon storage in agroforestry: an estimate for sub-Saharan Africa’ Climate Research, vol. 3, pp. 39-52. Faidherbia albida is a nitrogen-fixing Acacia tree that is widespread throughout Africa, growing in a variety of soils and climates. Faidherbia is able to make large quantities of nitrogen available to nearby crops and increase the store of carbon above ground and in the soil. It sheds its leaves in the wet season and retains them in the dry season, allowing for light to pass through in the wet season whilst providing residue in the dry season. 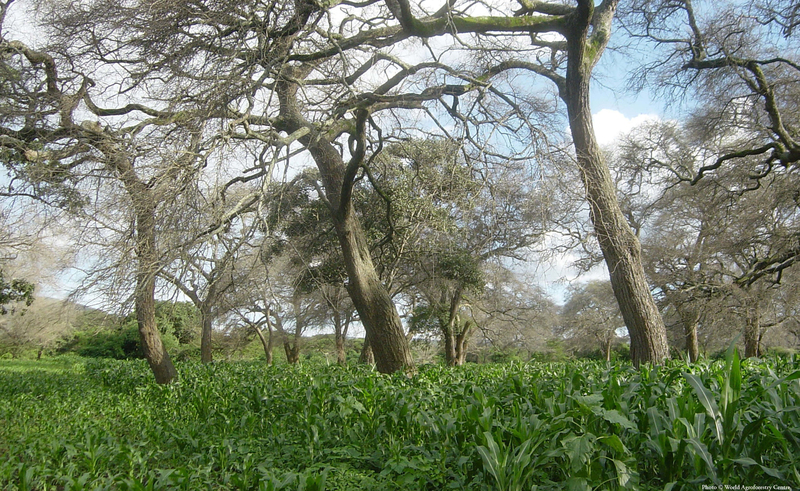 As a consequence it is possible to plant and grow maize under the trees. Yields can reach more than 3 tonnes per hectare without fertilisers, depending on the amount of nitrogen fixed by the trees. The trees also contribute 2 tonnes or more of carbon per hectare to the soil and mature trees can store more than 30 tonnes of carbon per hectare. In Malawi, Faidherbia provided 300kg of fertiliser per hectare and boosted unfertilised maize yields from 2.5-4 tonnes per hectare, 200% to 400% more than national averages, when planted every 10 rows. In a survey of 300 farmers in the Dedza district of Malawi, those that grew Faidherbia did so in order to improve soil fertility on their farms (starting when the trees are 4 to 6 years old), did not use nitrogen fertiliser and were keen to grow more trees. 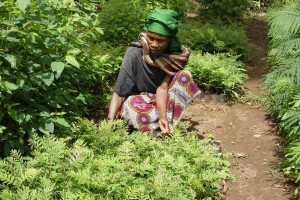 In Niger, Faidherbia has been planted on almost 5 million hectares of land leading to similar benefits. The climate change mitigation potential for systems incorporating trees with fertilising properties lies in their ability to sequester between 2 and 4 tonnes of carbon per hectare per year, compared with 0.2-0.4 tonnes of carbon per hectare per year under conventional conservation farming systems. However, Faidherbia trees take 6 years to fully develop, making investments hard to justify, particularly if land tenure is insecure and/or farmers are dependent on immediate benefits and incomes. At present Faidherbia is grown on only 2% of Africa’s maize area and 13% of sorghum and millet area. New Agriculturist, 2010. Faidherbia - Africa's fertiliser factory Available from: <www.new-ag.info/en/developments/devItem.php?a=1036> [25 June 2015]. Phombeya, HSK, Simmons, E & Giller, KE 2005, ‘Farmers’ perception of the value of Faidherbia albida trees in the farming system of Central Malawi’ African Crop Science Conference Proceedings, vol. 7, pp. 1459-1463. Makumba, W, Akinnifesi, FK, Janssen, B & Oenema, O 2007, ‘Long-term impact of a Gliricida-maize intercropping system on carbon sequestration in southern Malawi’ Agriculture, Ecosystems and Environment, vol. 118 nos. 1-4, pp. 237-243. 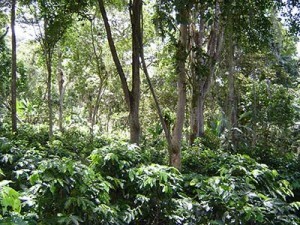 In central Costa Rica, coffee trees are intercropped with Erythrina poeppigiana shade trees on steep slopes to reduce soil erosion. The shade trees reduce runoff and boost water infiltration into the soil. They can also enhance coffee production by protecting coffee trees against drought. However, introducing these trees into the system can have negative impacts such as harbouring pests and diseases that can be transmitted to coffee trees, or intercepting sunlight. Whilst yields are typically higher when grown in direct light, shade-grown coffee beans are larger, weighing 0.15g per bean as opposed to 0.13g per bean, and are of higher quality. 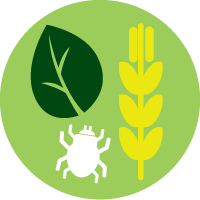 To maximise the benefits whilst reducing competition between the two species, Centre de Coopération Internationale en Recherche Agronomique pour le Développement (CIRAD) worked with a local coffee cooperative to test a novel way of overcoming these challenges. By dividing the farmers into different typologies based on environmental conditions and socio-economic situations, researchers were able to create a model to provide recommendations tailored to farmers within each grouping. For example, because the plots of the “labour-intensive” and “shaded system” groups receive a lot of sunlight, they could plant more shade trees to control for erosion. In contrast, for “input-intensive” and “extensive” groups, whose plots receive less sunlight but more rainfall and humidity, planting more shade trees would increase the risk of attacks by the fungus Mycena citricolor, that causes American leaf spot disease. The conceptual model helped analyze the key processes and trade-offs for each group and helped make recommendations of adapted erosion control practices. The model also showed that for some groups, less time-consuming erosion control actions such as building drainage canals, terraces or vegetative barriers that do not impact coffee production might be more suitable altogether. In contrast, using shade trees or manual weeding worked better to control erosion as opposed to herbicide use. Overall, the method of prototyping agricultural systems as they respond to different constraints can offer a basis for more productive discussions in participatory research programmes. Meylan, L, Mercot, A, Gart, C, Rapidel, B 2013, ‘Combining a typology and a conceptual model of cropping system to explore the diversity of relationships between ecosystem services: The case of erosion control in coffee-based agroforestry systems in Costa Rica’ Agricultural Systems, vol. 118, pp. 52-64. In 1984 the Tanzanian President, Julius Nyerere, visited Shinyana and was shocked to see that decades of deforestation and inappropriate land use, including damage from livestock, had turned the area into the ‘Desert of Tanzania.’ In response he launched the Shinyanga Soil Conservation Programme (HASHI). HASHI ran demonstration sites to teach farmers how to plant woodlots that yield firewood and building timber as well as fruit trees to provide fodder for livestock. The project also supplies equipment such as long knives, wheelbarrows, and watering cans to smallholders. An important part of the programme is encouraging the use of ngitili, a local word for an enclosed area of forest traditionally reserved to produce fodder for livestock during the dry season. 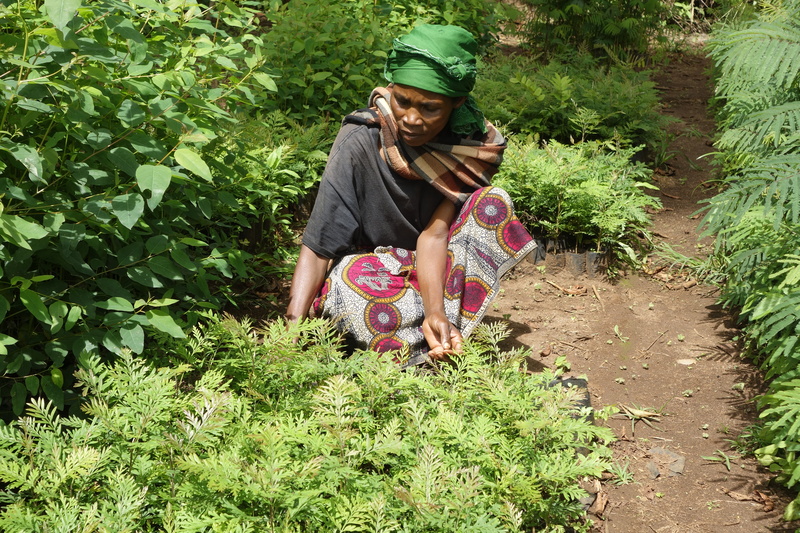 Input from the World Agroforestry Centre encouraged the project to introduce a range of agroforestry technologies to build ngitili, including the planting of woodlots and fodder banks and the use of nitrogen-fixing trees to increase fertility and crop yields. Deoscory Msoma is a smallholder who benefited from HASHI in 1993 reported, “The HASHI project transformed my life…The profits from my woodlots and orchards meant I could buy extra land, pay school fees for my children and renovate our house.” His family can now afford proper medical care and he’s been able to buy fertilisers. Where he used to produce 7 sacks of rice from 1 half-acre field; now he produces 20 sacks from the same area. He also benefits from the sale of firewood and building timber. For example, in 2010 he prepared an order of timber for the local army barracks worth Ksh600,000 (US$420). Now, approximately 60% of the ngitili, are privately owned, and the other 40% are managed by village governments, schools, community-based organisations, churches and mosques. Approximately 90% of livestock farmers and 50% of crop growers now have their own ngitili covering around 500,000 hectares. Pye-Smith C 2010, A Rural Revival in Tanzania: How agroforestry is helping farmers to restore the woodlands in Shinyanga Region ICRAF Trees for Change no. 7, World Agroforestry Centre, Nairobi.